It is beautiful to behold the relationship you have with Samantha Andrew, a true blessing for everyone who meets you and Samantha. I marvel at the perfection of the constellations of couples, of friends, of families, when people get together and embrace the amazing love that we all are and can live. I love how you both felt this when you first met and how this has evolved and continues to inspire. This is a beautiful example and reminder of the importance of expressing our love and appreciation for people in our lives. ‘I know I love and understand you more now because I love myself and understand myself more deeply than I did when we met.’ There is something immensely enriching and expansive about deepening our relationship and understanding of ourselves. The more you go the more obvious it becomes that ‘I’ does not exist as the solitary individual we have been believing. We are far more. And so is everyone else. 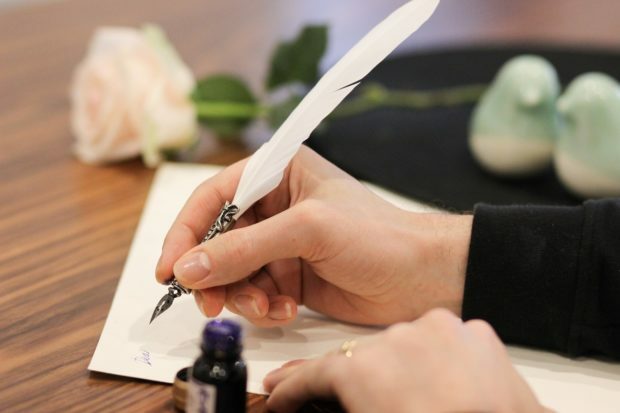 How beautiful to write a letter to our loved ones like this. We do not stop enough to express our appreciation for the awesome relationships we have, be they friendships, family or partners or our colleagues and ‘superiors’ at work. This has inspired me to start to write a few letters. Thank you Andrew. Very true Elaine, I was feeling this too, to express our love and appreciation more is a joyous way to live. Yes – the complete antithesis of those who refer to their partners as ‘the wife’ in public. When I hear men do this I can sense that underneath there isn’t really a dismissal here simply an alignment to what is expected of them to express. That said when we fail to express the love and appreciation we really feel we are all left much lesser as we keep the circulation of dismissal and denial going. Sadly so true. It’s so beautiful to read about a man’s love of his partner that is so full. When it’s a public dismissal of this love what is being communicated? That’s it’s somehow not ok to love in full without reserve? That, in some way, that’s not ‘manly’, but weak, that the extent of how we truly feel is somewhat problematic? We all lose when this happens. A very beautiful expression. A sharing that goes beyond a letter from a husband to a wife. A letter of love that inspires us all to be the more that we are. Every single paragraph of this love letter invites me to pause and consider the depth of appreciation in which it is possible to hold another. Thank you and in my experience we can never stop deepening our appreciation of others and ourselves and there are so many moments in the day that present opportunities to practice this. Thank you Andrew, it is so beautiful to read and feel this, I am inspired. When love is shared it naturally extends to inspire others. How could this be any other way..
Andrew you can so feel the dedication, commitment and willingness to evolve together in your relationship, this is really inspiring, thanks for sharing. Absolutely love how you describe Samantha, when I hear this I know who she is and how beautiful she is just because of what you have shared. What I love Andrew is how you share that you knew from a young boy that integrity, decency and respect were the basic values that we hold each other in. With that as your base line where you honour and live this with another then there is going to be deeper levels that we will naturally want to go to. Wow I look forward to reading your next blog in a years time and seeing how it evolves. A beautiful, tender loving letter, from a beautiful tender loving man. “There is no perfection and more of our potential to develop, but I can sense that we are on the verge of something even greater. I can sense the purpose in building the love between us to bring more of this love to the world. There is so much to celebrate!” Love it Andrew, this is how all relationships could be, on the verge of something greater, the love you and Samantha have is definitely something to celebrate. ‘I know I love and understand you more now because I love myself and understand myself more deeply than I did when we met.’ – with this as our foundation to love another then we have the potential to truly evolve and expand as we are asking nothing from the other just appreciating what each other brings. I love how this then develops if we so choose to is not to accept anything less than all of what the other person is, to support and grow by calling out what is not of the love that we know and not get comfortable with a level of love that will just do. Your relationship Andrew with Samantha is a great reflection of this, very inspiring thanks for sharing. So much of what you have shared Andrew drips of a complete Humble-Appreciate-Ness. To be Humble is to Being the base we use to overcome the spirit and become Soul-Full; So the spirit feels the truth of the soul. To be able to express love as simply as you have done offers us all a fresh platform to consider in the expression of love in our own lives. Do we ever really tell someone how much they mean to us, with such a deep level of appreciation? This letter just melts me. The fact that we are able to love each other to this depth and reflect it in relationships at a time when there is not much love in the world. There is so much more to our relationships than just meeting another’s need and yet many of us had made this the end goal of a successful relationship. It is lovely to hear the appreciation of your wife for her qualities and presence Andrew. “I know I love and understand you more now because I love myself and understand myself more deeply than I did when we met” – this is absolute. Absolutely true. Relationships are not for our own gain but constellations of people that choose to explore how much love can be lived in the understanding that it will be for everybody else to be shared with too. At the time I met my wife I did recognise there was something special to her, something ancient like I knew how living with her would bring me back to ancient times where we knew what true relationships means and can bring into our lives. And I can say I am very much blessed by being in a relationship with her, as indeed we are now living more of the love we all know from our ancient origins but not as a faint remembering but as a reality in the here and now. This is exactly how I felt too Nico. I love how you describe the ancient feeling. ‘We are eleven years married this year and yet it feels like we are beginning all over again.’ Gorgeous Andrew and Samantha – every day a new beginning only to bring more love to the next!! Amazing appreciation and claiming of the true depth of the relationship you share and all that Samantha brings. So lovely to return to and re-read. To truly understand another is a doorway to heaven. Whatever we know that is true is freeing to live. The world would be full of much healthier and much happier relationships if every one appreciated their partners this much – love it Andrew. Agreed Meg, and often we do feel this way but don’t express it. I’m certainly learning the importance of expressing not only what is going on for me but how I truly feel rather than the actions of the day. The more I express that feeling the greater love I feel not only with my partner but with myself and others. We tend as couples to make life about function, while there is so much more to explore in an intimate relationship that is beyond words to describe here but is well explained in the A love letter to my wife blog above. I know Meg that was what I was feeling too, it is just so gorgeous to read and you really get to feel the person that is described in this way. Respect and honour are only childsplay compared to this level of love. The love you share is amazing and when we get to feel and observe what you have shared it makes me feel the tears of Joy because I am blessed to know you both as friends. Agreed Greg, its a great example to express, share and be open with the depth of love we feel for my experience has also been when we do this we allow an even deeper love to be there.